This is the largest species of Uromastyx, reaching at least 30 inches. You must provide a large enclosure between 5-6ft when adult. What does the Egyptian Uromastyx look like? The Egyptian Uromastyx is the giant of the genus reaching sizes of 76cm (30 inch) if not more. They have a large spiny tail, this is used againt predators in the wild. They have a Tortoise shaped head and a strong jaw. Adult colour is dark brown to blackish while babies are a dark grey with yellow spots or broken bands across the back. They may be dull and lack colour, but they make up for this in their personality. When picked up they rarely struggle and can become very tame. Caution should always be taken as they have a strong painful bite and the spiny tail can scratch and draw blood. Where are Egyptian Uromastyx from? This lizard comes from hot arid and rocky areas in Egypt. How do you keep a Egyptian Uromastyx? You should house one specimen per enclosure (unless breeding), this being a minimum of 5-6ft when adult. 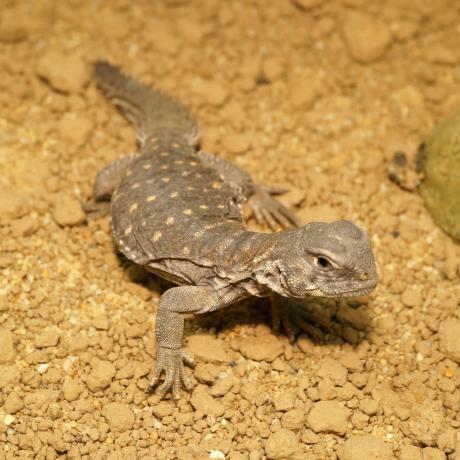 Ideally provide an adult Uromastyx with 6 inches of sand to allow burrowing. A number of shelters must be placed throughout the enclosure, these are mainly made out of rock slabs or reptile caves. Lightly mist under one hide every few days to maintain a 50-65% humidity level, this should not be any higher then 70%. Uromastyx require very high temperatures, the basking area should reach 49-60C (120-140F), the remaining vivarium temperature should be roughly 26.5-32C (80-90F). A night time drop to 18C (65F) should be allowed. It s very important to have all lamps connected to a thermostat, you should never guess the temperature. Provide a 10% UV-B strip light or a UV-B mercury vapour lamp. The latter may cost but the UV-B travels much further than the strip lights, this bulb also gives off heat for basking. Try to avoid the cabbage vegetable such as broccoli, brussels sprouts and also spinach, these foods may interfere with calcium intake. Babies and juveniles will take the odd insect, offer a few each week. Add a calcium supplement with a small amount of Vitamin D to their food, babies are fast growing and require this more than adults. You can also use the T-Rex Sandfire Uromastyx dust. Adult Uromastyx do not require a water dish, they seldom or never drink from open water. Babies do need more water, once a week place them in a shallow water dish to hydrate by drinking and soaking.